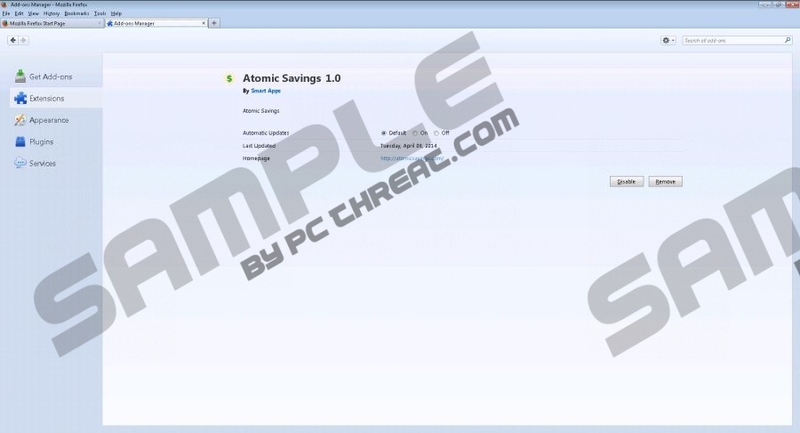 You might see various advertisements with a label “Ads by Atomic Savings” if you have this advertising-supported application installed on your system. This program is very pesky and it is very probable that it will not allow you to browse the web freely. Atomic Savings itself has been published by Smart Apps; however, you might notice Engaging Apps or Enchanted Apps placed as a publisher. It is known that this adware program is compatible with all the major browsers, including Internet Explorer, Google Chrome, and Mozilla Firefox, which means that the only way to get rid of Ads by Atomic Savings is to erase the advertising-supported program (adware) from the system. Atomic Savings has not been created for your benefit even though it claims that you will be provided with available coupon codes and get the best deals. You will notice these coupons on all the most popular shopping websites and you will see different kinds of commercials promoting particular services and products on various webpages without any particular exceptions. You should not click on those ads as they might lead you to corrupted websites where you might infect your system with malicious software. Another reason why we do not recommend keeping Atomic Savings on your system is because it does plenty of annoying activities, for instance, changes Windows hosts file, which means that you will be redirected to some kind of website if you enter a particular combination of letters. What is more, this adware program installs BenchUpdater together with it and it does not even require your permission for that. This application is basically classified as an adware helper and it is responsible for updating extensions and changing hosts file. As you can see, this adware acts unforgivably because it installs other software without your consent. Do you wonder how could Atomic Savings application enter your system? Actually, it is not very likely that you have downloaded it yourself because the download on its official website is disabled. However, the possibility that you have downloaded and installed it with other applications is rather high. Careful installation of new software will probably help you to avoid unfamiliar programs. Besides, you should always keep your security tool in order to scare away infections. If you want to get rid of Ads by Atomic Savings, you will have to remove the adware program first. You can do that easily and quickly via Control Panel. The instructions provided below will guide you. However, if you have never tried to erase malware and do not feel confident about that, you can acquire a reliable antimalware tool and then scan your system. In our opinion, SpyHunter is definitely a tool that you can trust. Click on the useless application and click Uninstall. Move your cursor to the bottom-right corner of the screen. When Charm bar slides out, select Search. Type in Control Panel into the search box and click OK. Locate and click on the software that you wish to erase. Quick & tested solution for Ads by Atomic Savings removal.